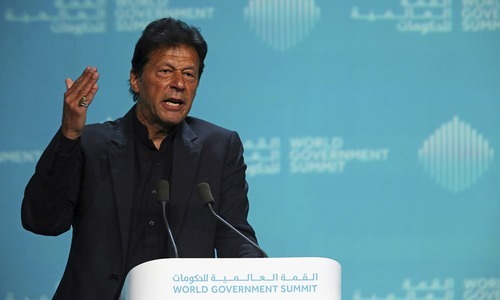 The Supreme Court on Tuesday noted that the money trail submitted by Pakistan Tehreek-i-Insaf (PTI) Chairman Imran Khan regarding a sum of nearly 100,000 pounds was inconsistent. A three-member bench of the apex court ─ headed by Chief Justice Saqib Nisar and comprising Justice Umar Atta Bandial and Justice Faisal Arab ─ was hearing a petition filed by PML-N leader Hanif Abbasi which seeks the disqualification of PTI Secretary General Jahangir Tareen and Imran over the alleged non-disclosure of assets, existence of offshore companies, as well as receiving foreign funding for PTI. A day before, Imran had submitted additional documents before the apex court, seeking to provide a money trail of nearly 100,000 pounds that the SC had raised questions over. As he submitted the documents before the court, Imran had backtracked on his earlier position that approximately 99,000 pounds had been spent on legal fees and associated costs. Instead, he had claimed that the amount had only initially been retained in the bank account of Niazi Services Ltd but parts of it were later remitted to him by the company. During Tuesday's hearing, the chief justice remarked that the record of the sum is being submitted before the court in pieces and is inconsistent. The chief justice noted that Imran had not yet submitted any record before the court to help determine whether or not the amount had been spent on legal fees. Furthermore, Justice Bandial added that no record had been provided regarding 27,000 pounds out of the total sum. Imran's counsel, Advocate Naeem Bukhari, told the court that on May 26, 2003, the PTI chief's former wife, Jemima Khan, had transferred 93,000 pounds to Imran for the purchase of the Bani Gala property. He added that the amount was received by Imran in pieces; he first received 40,000 pounds and then 42,000 pounds. The court ordered the petitioner to file his response before the bench. During Tuesday's proceedings, the counsel representing Tareen told the apex bench that his client had submitted all the records pertaining to 18,566 acres of land which, he maintained, Tareen acquired through a lease. However, the court reminded the lawyer, Advocate Sikander Mohmand, that his client has yet to submit khusrabandi and malia records which the bench had sought during a hearing on Oct 5 along with other relevant revenue records showing how much money Tareen had paid to the lessor to get lease of 18,566 acres of land in 2010 as well as evidence proving that he had earned around Rs1.6 billion agriculture income from the said land. The lawyer told the court that records of the tax paid by Tareen on water and electricity have been furnished before the court. He maintained that the owner of the land — and not his client — was liable to pay taxes on the land. The court, however, again ordered the lawyer to submit the revenue records. The hearing was adjourned until tomorrow (Wednesday). Imran Khan changed his statements. Imran Khan gave inconsistent documents. It is a like a school where a teacher is very strict with students except those who are the children of highly rich and powerful people. Such children keep getting more opportunities to hand in their work and the teacher always finds ways to be lenient with such students. Bravo SC. I am not against holding IK accountable but this is just sad. The man did not hold a public office af that time. Look at who the petitioner is. NS was disqualified for the reason he was not Sadiq and Ameen. Now it is interesting to see if IK can prove that he is Sadiq & Ameen. I am a voter and supporter of IK but this is a good stuff from SC. No matter how big you are but no one should be above the law, period. IK is a liar and he will be disqualified very soon ! IK is an honest man. Nation Stands with him always. IK has no future and therefore Pakistan has no future with IK. ! For the last couple of months I am reading the tweets of Jamaima and IK whereby each of them praising one another for safe keeping of records, finding the records, submitting records to court etc. but on each hearing, the honorable Court is still looking for those records. Either inform court that you need 90 days to locate, arrange and submit or speak truth that you don't have the money trail. IK is trapped in his own net. @Wasim ... no need to check who is petioner becase sh Rasheed was peritioner against nawaz sharif. secondly if IK was not any public holder at that time then I would like to remind you that honesty level is checked of everyone not only office holder. case is concealment of assets as nawaz sharif concealed salaray which he never received from his son. Question is did imran khan held any public office at time of accrual of that money.... No... So court should take a chill and announce the verdict in favour of khan. @pervaiz and how exactly did his son have the means to pay this salary? A very biased article yet again against Imran from the leading English Newspaper of Pakistan. I don't understand what Dawn's agenda is?? @Abdullah yes in changing the statements. @The end is near : u mean even he is a corrupt person. And why Imran is in the courts? For not keeping receipts of his own personal budget/ money? For transfering looted money when he was Prime Minister and Chief Ministers or held public office? He is there only because he raised the voice against the Mafia , because he talks about Pakistan and common Pakistani. But no one in the courts ask this basic question. Put the names of the real criminals on ECL and take back their VIP protocols. Imran Khan is a national hero who earned all his money abroad and then brought his hard earned money back to our country. How can this be corruption? Imran Khan is a honest man even his enemies vouch for his honesty. Look like SC wants to disqualify IK just to balance the pressure from PMLN. I am working overseas for ~20 years and if someone ask me what I have remitted 5 years ago I have no record. This will be the case for 99% of the Pakistani working overseas. On the other hand, Nawaz Sharif case is entirely different, he was 3 times PM, 1 time chief Minister and also finance minister. He increased his wealth while in public office, IK has never been in public office. If the SC kept this criterion for qualification/disqualification, they themselves will be disqualified as SC judges. Do we really deserve a honest leader like Imram Khan ! Current leader and future leader both are going to end up in jail. We can eradicate corruption only when we gave good people in politics, or else these people know how to play there cards to fool people. Great! It seems that the Court has a lot of time to waste. "The lawyer told the court that records of the tax paid by Tareen on water and electricity have been furnished before the court. He maintained that the owner of the land — and not his client — was liable to pay taxes on the land. The court, however, again ordered the lawyer to submit the revenue records." @Wasim " The man did not hold a public office af that time." Neither did Altaf Hussein, and moreover he never intended to. IK was in forefront to hold him accountable, for something that was done by his followers, but now has good relations with the same followers. IK opened a pandora's box, so he may be caged in it.